How Would Nate Silver View Energy Consumption? If you’re following the American political election campaign closely, you’ve probably run across Nate Silver’s weblog (now subsumed under the NY Times rubric) called Five Thirty Eight (named for the 438 Congressional and 100 Senatorial seats that are contested). He is one of 7 or 8 forecasters that were smart enough to invest time and energy into looking at races at a more local level (as well as national polls) than most news organizations, who were content to take the output of national polls and pass them on to news consumers. Nate Silver and his competitors seem to be doing a better job of predicting past results and frankly I trust them much more than the national polls alone. The reason Mr. Silver and those like him are beating the big pollsters is that looking at polls together and including polls of smaller geographic regions like states allows for more granularity in the results achieved. Where a Gallup poll or Pew survey can tell you what 1,000 people respond across the U.S., some state polls get 1,000 responses for the individual unit. That’s better. So Mr. Silver can not only get more accurate information about the country’s opinion, he can tell us how the Electoral College results are shaping up. There’s a parallel between what Mr. Silver has done with U.S. politics and what I am trying to do with global energy consumption. The forecasts most people are familiar with are large, model-driven efforts from organizations like the U.S. Department of Energy’s Energy Information Administration or the International Energy Agency. They incorporate a lot of inputs about fuel supplies, changing portfolios and projected prices and create supply-driven forecasts. However, many of their results are reported at the regional level, which tends to hide the very different market dynamics between, say, South Korea and Indonesia, or South Africa and Zimbabwe. This figure shows the difference in quadrillion BTUs (Quads) projected for consumption in 4 countries. 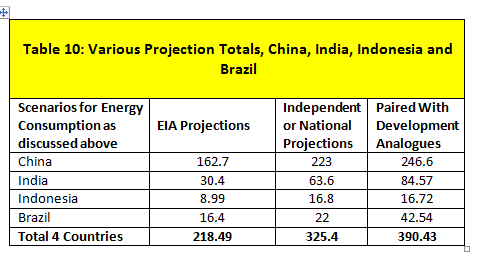 The DOE’s EIA figures are compared with the projections from national or independent organizations, and my estimates are in the right hand column. The estimates are for 2030. I think Nate Silver would say that a more granular look would provide more accurate results. As it happens, many countries have government departments or independent countries that provide estimates of future energy needs. Those estimates are very different to what the models from large organizations project. My suspicion is because the local estimates understand that fuel consumption is driven by more urgent needs and a willingness to pay than the global estimates that consider fuel availability at what they think is an affordable price. Because the local estimates are in fact very close to the totals I came up with in my report Energy Consumption in the Developing World in 2030, I am naturally predisposed to favor their figures. But I think that logic as well as my personal bias argues in favor of trusting the boots on the ground. The territory they cover is smaller. They spend just as much time getting their country’s figures as the mega-model makers do for the world. They understand their people and their markets better. And now I can say, well, Nate Silver would do it my way if he were to do it at all! I have written before that India has lots of coal–and they do. I have also written that they have had a heckuva time getting it out of the ground–and they have. 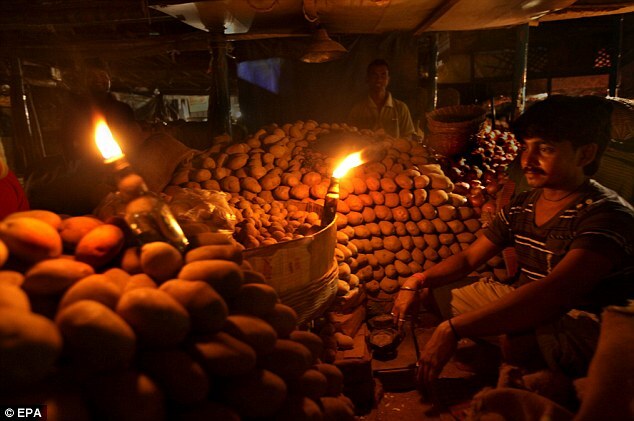 Corruption, lethargy, too much regulation… all have conspired to keep much of the population in India as energy starved as they are malnourished. As noted on Climatewire, however, “India is poised to contend with China as the globe’s top consumer of coal, with 455 power plants preparing to come online, a prominent environmental research group has concluded. The coal plants in India’s pipeline — almost 100 more than China is preparing to build — would deliver 519,396 megawatts of installed generating capacity. That is only slightly less than pending new capacity in China, which remains the undisputed king of coal consumption.” The story is based on unreleased data from the World Resource Institute–I hope the data escapes soon. Choosing the lesser of two evils is part of modern life. The lesser of two evils is to burn coal, dirty as it may be, to bring energy to India. I hope that solar and wind power can make this period short and that hydroelectric power plays a larger role as well. According to the WRI analysis, more than 34,000 MW of coal capacity is slated to come online in Vietnam, 30,000 MW in Turkey, and 22,000 MW in South Africa. For these countries, albeit for different reasons, there is the opportunity for at least partial substitution in fuel sources–hydro for Vietnam, solar and wind in Turkey and all of the above for South Africa. But for India, as with China, we’re going to have to bite the bullet and live with a generation of massive increases in the use of coal. It won’t be pretty. It will exacerbate not just conventional pollution but anthropogenic climate change (although we can hope that the particles emitted will counter the effects of some of the CO2). But it just isn’t going to be pretty. I’m happy to announce the publication of my most recent report, Global Markets and Technologies for Photovoltaic Systems, by the research company BCC Research. You won’t be finding it in your local bookstore–the purchase price is $4,850, although you can get bite sized chunks at a much lower price. The report has actually been in the post-production process for some months, now and I felt it useful to sit down and read what I had written. If the caveats I put in the report are included, it stands up pretty well. The photovoltaic industry has been in a dramatic state of turmoil, and I was a little concerned that my report would have been out of date on the date of publication–something I included in the report. My short summary of the contents would probably be “The global market for photovoltaics will see five years of strong growth, but that growth will be profitless for almost all involved in the industry.” One thesis I advance is that it’s time for the rest of the logistical chain in PV to work as hard at lowering prices as module makers and polysilicon producers have over the past few years. There is still low-hanging fruit in shortening and lowering the cost of installation, permitting and some elements of the balance of systems. Europe holds the largest share of the market and should increase from nearly $16.7 billion in 2012 to $35.1 billion in 2017, a CAGR of 16.1%. 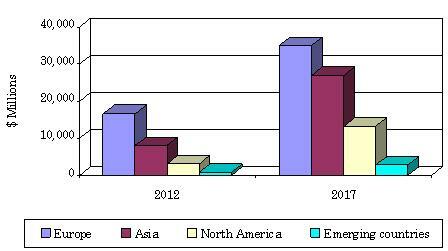 Asia is expected to increase from nearly $8 billion in 2012 to $27 billion in 2017, a CAGR of 27.6%. Modern PV technology dates back to the 1950s and the advent of the space program in the 1960s, but the concerted effort to develop this technology for industry and consumer use began during the oil embargoes of the 1970s. However, the eventual stabilization of oil prices had a dampening effect on investment, tax credits and government funding for research and development. Companies in the PV business have focused on reaching grid parity—where electricity generated by solar power is equal to or below the cost of electricity from competing sources—as a way to broaden the scope of PV. Nations and individual states began to offer serious incentives such as tariffs and tax credits for solar customers. Consequently, we were interested in looking at this industry once again to chart its potential. Since 1978, the installed cost of solar electricity has charted a downward path strongly reminiscent of declines in the cost/performance ratios found for computer memory and MIPS (million instructions per second, a common metric for performance in the computer industry). From $5/kwh in 1978, the cost of electricity generated by solar power has dropped to $0.20/kwh in 2010. 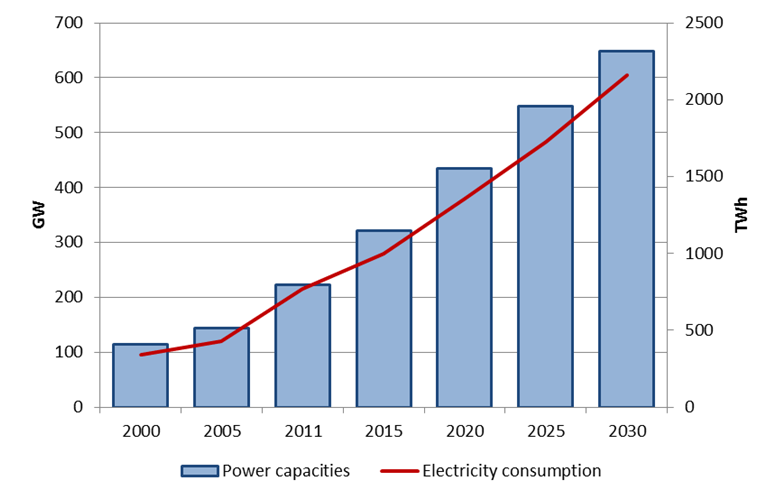 A simple extension of this curve would bring the cost of electricity delivered by solar sources to parity with other generating sources by 2015. Although few believe the performance of solar power improvements can match the dramatic improvements in computer technology, it has only to continue for three more years to make an impact on the marketplace. A lot is riding on the short-term performance of solar power and many are keenly interested in the results. India’s Central Statistics Office has published their Energy Statistics 2012 document, a provisional assessment of the state of play for the country. It’s interesting, to say the least. They lead off with an energy map of nuclear power generation–and India has 52 plants with 6,780 MW capacity either up and running or under construction. Nuclear power capacity grew 4.8% in 2011. When the report covers renewable energy–wind and solar–it concentrates on potential, referring to an estimated wind power potential of 49132 MW (55%), SHP (small-hydro power) potential of 15,385 MW (17%), Biomass power potential of 17,538 MW(20%) and 5000 MW (6%) from bagasse-based cogeneration in sugar mills. That’s because actual renewable production is fairly low. India is 10th in the world for solar, but it amounts to about 600 MW installed last year. When it comes to current capacity, “The total installed capacity of grid interactive renewable power, which was 16817 MW as on 31.03.2010 had gone up to 19971 MW as on 31.03.2011 indicating growth of 18.75% during the period. Out of the total installed generation capacity of renewable power as on 31-03-2011, wind power accounted for about 71%, followed by small hydro power (15.2%) and Biomass power (13.3%). India is the 5th largest energy consumer in the world and its people wish mightily that it ranked higher. Their energy consumption in 2009 was 21.7 quads, not nearly enough for their huge (and growing) population. Their per capita energy consumption is on a par with Swaziland. India imports about 75% of its oil. In fact, one-third of all India’s imports consist of oil. That is expected to rise to 80%, as energy consumption rises. India’s need to import gas is not as bad, but it is also rising–from 25% of their needs to half by 2015, according to the Financial Times.